This is the first speaker with Alexa to be created by an expert in audio. Other speakers have been created by smart companies, but not leading in audio quality. 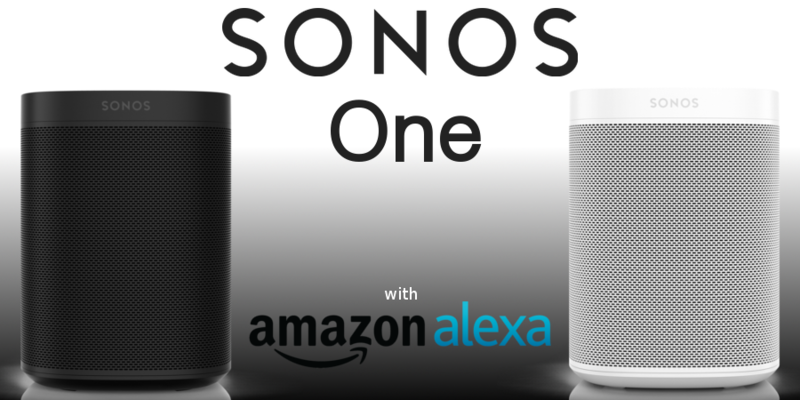 With the all new Sonos One, you are guaranteed amazing sound quality along with Amazon’s AI. By just looking at the new speaker, it looks almost identical to the original Play:1. The size and shape remain the same. The only notable difference is the removal of the grey wrap-around grille, which has been replaced with one that is black or white (depending on which colour speaker you buy.) Because of this change, the One blends in more seamlessly to the background than its predecessor. It’s when you look at the top plate of the new Sonos speaker that you see some changes. The three buttons that were on the Play:1 have been replaced with a touch-sensitive panel that is adorned with with a circle of small, white LEDs and symbols which represent: play/pause, the mic and the Sonos’ context-sensitive actions. The white LEDs let you know when Alexa is awake and responding. Sonos wants to make everyone aware that you can turn it off completely by just tapping the mic symbol, and once the lights are all off you know you have total privacy. It’s recommended to have Alexa switched on, because as Sonos promised, it is deeply integrated in the speakers – more so than rivals. You can talk to these speakers the way you would Amazon’s own Echo. Instead of the long winded “Alexa, play Little Mix on Sonos.”, all you have to say now is “Alexa, play Little Mix.” Yes it doesn’t seem a lot, but in the long run it’s so much easier. If you want to use voice control to play music in other rooms, by being more specific will let you have better control. “Alexa, play Little Mix in the kitchen”, saying this will end the music to the Sonos unit you’ve equipped to that ‘zone’. Whereas, if you say “Alexa, play Little Mix everywhere” the whole set of Sonos speakers will be booming their newest singles. If you’re worried that the One won’t be able to hear you pleading to change songs, don’t be. Sonos says that these speakers have a combination of noise cancelling technology, a thing they call ‘smart voice capture’ and a unique six-microphone array that guarantees that Alexa can hear you whenever you say it’s name. You’ll be aware when it’s activated, as the moment it hears it’s name you’ll get a chime in response, letting you know you can continue on with your request. The One speakers sound incredible, due to a brief hearing at its grand reveal people have been saying that the audio quality may be even betterm than the prestige Play:1. Considering that this speaker is in the price range on £200, this has a weighty and full-bodied delivery that can produce an alarmingly loud and spacious, three dimensional soundstage. The treble is precise and sharp without sounding harsh, and the voices are crystal clear and well projected, and the bass is bouncy and full of life. Similarly to the Play:1, two Sonos Ones can be added together to create a stereo pair that is more than capable of filling the whole room with hi-fi like focus. Or it can be used as surrounds in a PlayBase or PlayBar-based system, with or without a Subwoofer for that extra boost. 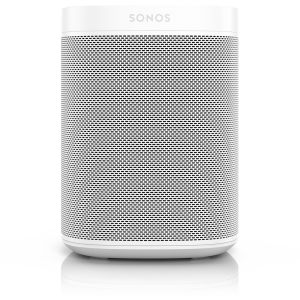 The Sonos One is a speaker that is focused on providing the listener with brilliant, clear audio with the added addition of Amazon’s Alexa. 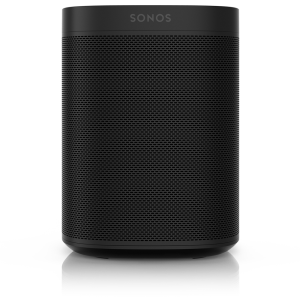 With Sonos being the manufacturer, you are guaranteed the best sound quality. And for such a good price, you should look into it too.